(Are you a coach looking for face to face learning and practice with group and team coaching issues? 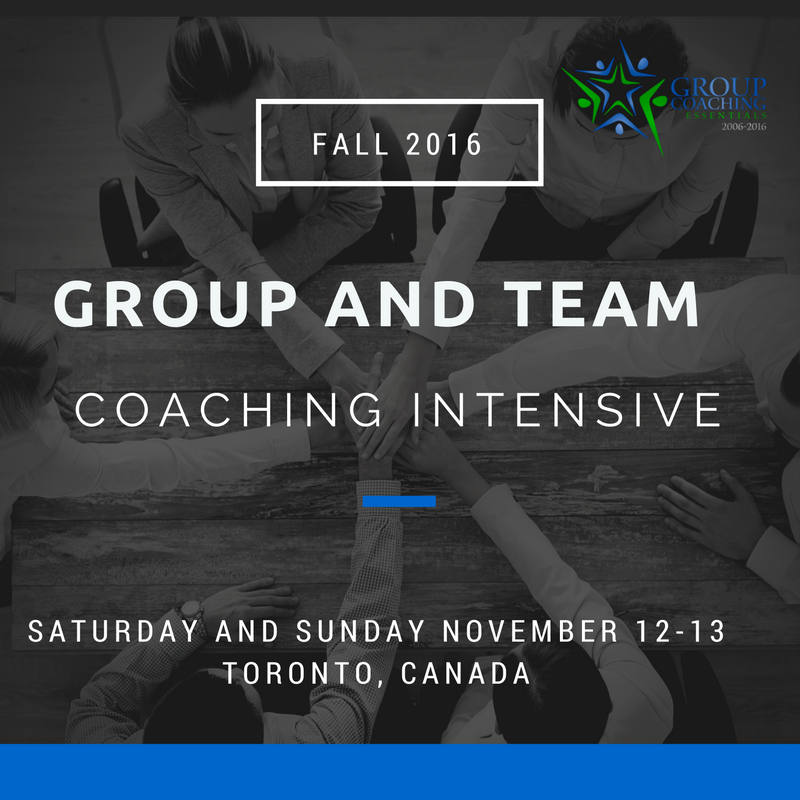 The Group and Team Coaching Intensive is a two day in-person training program, geared to provide coaches and professionals in related fields with knowledge and skills in group coaching, and the related field of team coaching. The program is approved for 19 CCEs with the ICF (17 hours of core competencies), including a new blended learning assignment. The program has been designed and is delivered by the woman who wrote the book on group coaching - Jennifer Britton, author of Effective Group Coaching﻿﻿ (Wiley, 2009), and From One to Many: Best Practices for Team and Group Coaching (Jossey-Bass, 2013). Our flagship program, the Group Coaching Essentials teleseminar turns 10 in 2016, and the Intensive turns six this year. A significant focus of the two day program is on practice and feedback on your skills with multiple opportunities to coach. Each coach is asked to bring a 25-30 minute group coaching process/exercise which they will run with the group. This is a hands-on small group learning experience and the program is customized. There is usually a range of 4-8 coaches participating in any one Intensive. We also offer the option for a handful of coaches to join us virtually for the program. For those joining us virtually you will be an active participant, but not having to travel! Join us in 2016 in beautiful Bracebridge, Muskoka or Toronto Canada for the two day Group and Team Coaching Intensive. Download a two page brochure about this program here. Contact Jenn for more information at (416)996-8326. In 2017 we are only offering one in person training session which will be held in Downtown Toronto on Monday and Tuesday June 19-20, 2017 (830 - 430 pm ET) both days. We are interested in bringing the Intensive to other locations globally and in Canada including Ottawa, Halifax, Vancouver during 2017. If you are interested in organizing an Intensive a group of 6-10 coaches in your community for 2017 please contact us. If you have a group of 6-10 coaches we can bring the program to you. Contact Jennifer for more information about pricing and to reserve a date. Download a two page overview of the Group Coaching Intensive here. Not a coach, but are looking for facilitation skills training? Join us in Toronto the two-day facilitation skills training program - the Facilitation Skills Intensive, or virtually for the Virtual Facilitation Skills Intensive(TM). Click here for more information. The Group and Team Coaching Intensive has been renewed for CCEs with the International Coach Federation. It is approved for 19 hours of CCEs with the ICF (International Coach Federation), including 17 hours of core competencies and 2 hours of other. This includes a post-program blended learning assignment as well. "Informative, Action Oriented and Professional"
An amazing opportunity for coaches to expand their capabilities and really learn what it takes to be a great group/team coach. Practical and inspiring! A group follow up call one month after the Intensive to check in on your progress, application and successes. In Person: $1095 CDN plus HST. If you register with a colleague you can each save $200 for a registration rate of $895 plus HST (more than 15% savings). Virtual: Can't make it to the venue? Join us Virtually over the two days via skype/zoom - $1095 US. Please email Jennifer to discuss that this option is best for you. You may also want to consider the blend of the Group Coaching Essentials teleseminar plus the Advanced Group Coaching Practicum (10 CCEs) which we offer throughout the year. Your in-person Registration can be paid in one or two installments. Prefer to pay offline? Contact Jennifer at (416)996-8326 or by email. Click here to download a two page info sheet on what you will need to participate virtually. Please contact Jennifer before you register for the virtual offering to make sure it will meet your needs. You will need to be available for both days. Cost: $1045 US.